DAYTON, Jonathan, (son of Elias Dayton), a Delegate, a Representative, and a Senator from New Jersey; born in Elizabethtown (now Elizabeth), N.J., October 16, 1760; graduated from the College of New Jersey (now Princeton University) in 1776; studied law; admitted to the bar; during the Revolutionary War served in the Third and later the Second New Jersey Regiment of the Continental Army 1776-1783, attaining the rank of captain; taken prisoner at Elizabethtown, N.J., and later exchanged; member, State general assembly 1786-1787, 1790, and served as speaker in 1790; delegate to the Federal Constitutional Convention in Philadelphia in 1787 and one of the signers of the Constitution; Delegate to the Continental Congress 1787-1788; member, State council 1790; elected to the Second and to the three succeeding Congresses (March 4, 1791-March 3, 1799); Speaker of the House of Representatives (Fourth and Fifth Congresses); chairman, Committee on Elections (Third Congress); was not a candidate for renomination in 1798, having become a candidate for the United States Senate; elected as a Federalist to the United States Senate and served from March 4, 1799, to March 3, 1805; was arrested in 1807 on the charge of conspiring with Aaron Burr in treasonable projects; subsequently released and never brought to trial; member, New Jersey assembly 1814-1815; died in Elizabethtown, N.J., October 9, 1824; interment in a vault in St. John's Churchyard; the city of Dayton, Ohio, was named for him. Papers: 2 items (1806, 1807) on land matters and the Burr conspiracy in the Jacob Burnet papers; 17 items (1789-1809) on surveying in the John Stiles Gano papers; and correspondence in the John C. Symmes papers, Dayton's associate in land speculation. Papers: 1 letter (February 26, 1805) from Aaron Ogden in Washington Irving's Life of George Washington, Volume X, Miscellany, 1764-1805; and 1 letter (July 8, 1807) from Governeur Morris in Volume XII, Miscellany, 1769-1838. Papers: 1 letter (November 5, 1803) from Aaron Ogden concerning a "power of attorney"; and 1 letter (July 2, 1799) from Franklin Davenport concerning a recommendation for Dr. Chamney. Papers: 1 Letter (17 Oct. 1808) from James Ross to Dayton relating to the future of the Federalists, and a typewritten transcript. Papers: 1789-1821. 67 items. Chiefly letters received. Papers: 52 letters from Dayton in the Joseph Vance papers, 1797-1815. Papers: In Dayton family papers, 1734-1868. 45 items. Includes correspondence and documents, primarily of Revolutionary period. Papers: 1788-1819. 23 items. Letter to Alexander Hamilton and letters received from Joseph Bloomfield, Elias Boudinot, David Brearley, and others. Additional Papers: Correspondence (1801) in William Patterson papers, 1766-1898; Aaron Ogden papers, 1783-1833; Silas Ward papers, 1810-1841 (bulk 1810-1825); and Gibbons family papers, 1767-1897. Papers: 1780-1824. 1.5 linear feet. Includes 55 letters from and 316 letters to Dayton, receipts, contracts, deeds, and material relating to Dayton's involvement in the Burr controversy. Papers: Correspondence in Tucker-Ewell papers, 1770-1893. Papers: Correspondence in Colonel John Brown and Major General Preston Brown papers, 1763-1865; and Southard Hay autograph collection, 1750-1885. Research Libraries Information Network In addition to the institutions listed above, items are also cataloged in collections at: Historical Society of Pennsylvania, Philadelphia, PA; New York State Library, Albany, NY; Rosenbach Museum and Library, Philadelphia, PA; and University of Pennsylvania, Philadelphia, PA. Bond, Beverley W., Jr., ed. The Correspondence of John Cleves Symmes. New York: Macmillan Co., 1926. 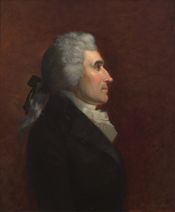 Includes correspondence with Jonathan Dayton, 1788-1796.